I love planning my garden. I keep putting in flowers and plants, thinking “this is probably going to look really good in a few years”. That’s the neighbor’s tree, but it’s very close to the fence and it hangs over our yard. Hydrangeas (and hostas) will do well in the shade underneath. A variegated Ivory Halo Dogwood will provide some privacy for the egg chair that I want so badly, and peonies and a lilac bush will provide some nice spring blooms. Next Post Lovely Tree! Now What? You’re so lucky that your neighbor has a beautiful tree and not something hideous and half dead hanging over your yard! p.s. just started a home blog & added you to my blogroll. hope you don’t mind. i’ve been a long time MIL reader. You could frame your illustration because it’s so cute! 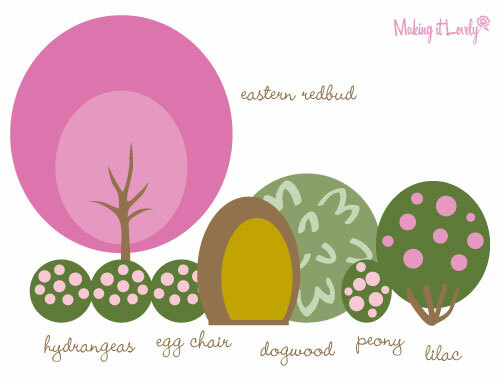 Oh, and your egg chair would be in the perfect spot to catch the scent of that lilac bush on the breeze! Your illustration is super cute! I think you should DEFINITELY “think” about getting that egg chair. I think it would be so nice to sit inside of it, smelling the lilacs, hydrangeas, and peonies. You could even look at them through the little “windows” in the sides!! I love planning for my garden too. It’ll be a lot of fun to see what these plants look like in a few years once they are more mature! My favorite right now is my Camelia bush. It’s evergreen, and has the most amazing red flowers in the early early part of spring. Love your plan! Cutest garden design ever!! so…I looked up the Ivory Halo Dogwood to see what it looks like in winter and when it flowers in the Spring, and it is beautiful! I now have serious Dogwood Envy and think I need to buy me some soon. Your garden will indeed look lovely. oh, what a nice representation of your future garden, so cute! I can’t remember where I came from but I’m glad that I found your site! I am loving your idea for a backyard area. Sadly, we’re too broke to produce anything worth while in our house that we’ll soon be moving from. *Sigh* But thanks for the inspiration. i just disovered your blog via Layers of Meaning. i’m a fellow-Chicagolander. it is so fun and fabulous! bright, colorful, loaded with whimsy, great design and lovely things! very well done!